Yesterday, our highest court voted in a 5-4 majority that partial-birth abortions, a procedure that involves partially removing the fetus intact from a women's uterus, then crushing or cutting its skull to complete the abortion, are unconstitutional. Quickly, future presidential contenders on both sides voiced their opinions. Every Republican candidate rejoiced that this restriction on abortion had passed. Every Democratic candidate thought it was a horrible day for women's rights. Ok, but I don't really care what you think about the moral implications of what the decision means? I only care if you think that the Supreme Court correctly interpreted the Constitution. If you think they acted within their means, even though you disagree with the moral sentiment of the outcome, shouldn't you be content with the Court's ruling? Similarly, if you think that the Court ignored countless precedents and interpreted the law incorrectly, shouldn't that be your argument? Not just, "I believe in women's rights" or "I believe in the rights of every unborn child". The 9th Amendment gives the people rights not mentioned. These right not mentioned however, can be infringed upon if necessary. The 14th Amendment brings up the idea of Equal Protection which reflects that all men are created equal. So this means a women, equal to all, may have the right to terminate a pregnancy. The courts have debated if this should depend on the viability of the fetus. This is the most interesting argument because if given a chance pre-term babies, some as young as 22 months, are able to survive. I guess the decision of the Supreme Court is held up if they decide that a baby recieves the fundamental rights given once they are viable. However, this reasoning is not sound because the viability of a premature infant depends vastly on medical care and medical technology innovations. i have to add something...kind of goes against what i said...it is from Justice Rehnquist. "To reach its result, the Court necessarily has had to find within the scope of the Fourteenth Amendment a right that was apparently completely unknown to the drafters of the Amendment. As early as 1821, the first state law dealing directly with abortion was enacted by the Connecticut Legislature. By the time of the adoption of the Fourteenth Amendment in 1868, there were at least 36 laws enacted by state or territorial legislatures limiting abortion. While many States have amended or updated their laws, 21 of the laws on the books in 1868 remain in effect today." Here's a bit from Black's dissent I thought was revelant to this topic. The case, Griswold v. Connecticut, involved a law banning contraceptives. The ruling was a bit of a mess, with a slew of opinions written and three different theories posed as to where the right to privacy can be found in the Constitution. "I agree with my Brother STEWART'S dissenting opinion. And like him I do not to any extent whatever base my view that this Connecticut law is constitutional on a belief that the law is wise or that its policy is a good one. In order that there may be no room at all to doubt why I vote as I do, I feel constrained to add that the law is every bit as offensive to me as it is to my Brethren of the majority and my Brothers HARLAN, WHITE and GOLDBERG who, reciting reasons why it is offensive to them, hold it unconstitutional. 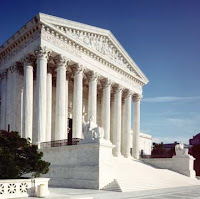 There is no single one of the graphic and eloquent strictures and criticisms fired at the policy of this Connecticut law either by the Court's opinion or by those of my concurring Brethren to which I cannot subscribe - except their conclusion that the evil qualities they see in the law make it unconstitutional." That guy, Black, says just what I was trying to say, except much better. Great find! Thanks! Hugo Black's dissent in Griswold was probably my favorite of all the ones I had to read for my constitutional law class (and briefly had me thinking about going to law school for constitutional law). His view that the 14th amendment protects citizens from the states infringing upon the all the rights stated in the Constitution and nothing else is still the one that makes the most sense to me. The selective incorporationist-plus view being used today, where only some rights listed in the Constitution, plus some not listed in the Constitution, are protected at the state level gives the justices far too much leeway. Plus, it means the rights guaranteed are prone to shift with the whims of the court. A new justice joining the court could lead to the creation of one right and the elimination of the other. That, in my opinion, weakens the constitution and subverts the amendment process.